Thanks for taking the time to meet our staff. Autobahn Collision Center is honored to have the finest staff of Professionally Certified Technicians in the west. We are continuously educating our staff to fine-tune our skills and performance, so that we can best serve our customers and community. We are committed to remaining innovative in our strategies in order to effectively meet the varying needs of our clients. We drive for perfection to make the process of auto repair as stress-free as possible by employing our vast wealth of experience on your behalf every day. Allow us to welcome you into the Autobahn Collision team. 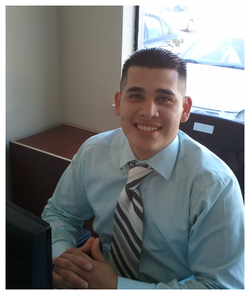 Gabriel has a well-rounded knowledge of the business having worked for AW Collision Group for 10 years. He started with the company as a Detailer and grew within the company and has held a position as Manager since 2008. Gabriel has completed Mercedes Benz Certified Body Repair Training as well as a Mercedes Benz Collision Repair/LT class. Bob has worked in the automotive industry his entire life. His experience and extensive understanding of the industry has allowed him to gain knowledge and improve his skills with regards to automotive repair. Bob’s passion for restoring cars has also led him to be a key person to starting Black Hawk Classic Car Collection in San Ramon. Bob is Gold level I-CAR certified in Aluminum & Steel Welding. Jeff is a collision repair expert with 22 years for continuous industry work experience. He has worked as an insurance appraiser, body shop estimator and body shop manager and began his career with AW Collision group in 1995. Jeff has completed Masters School of Auto Body Management classes and has also received certification in Estimating Classes. Kai’s career began for AW Collision as a Customer Service Relation and has been promoted to Sales Account Manager. Her combined experience in sales and customer service as well as her leadership skills has led her to travel between the shops to train employees on existing procedures. Kai works directly with the Director of Marketing and Controller to generate and maintain a credible forecast for accounts and territories. Tammee was welcomed to the AW Collision Group in January 2011. Her organizational effectiveness and previous experience in customer service has allowed her to manage and coordinate office operations efficiently. Tammee serves an integral part as the primary customer contact for general inquiries. Will began his career as a Dealer Coordinator and was promoted as Account Manager within a year of his employment with AW Collision Group. He plays a key role as a liaison between the dealerships and the body shop, working closely with customers to establish their needs.